I’ve had shoes on my mind recently. 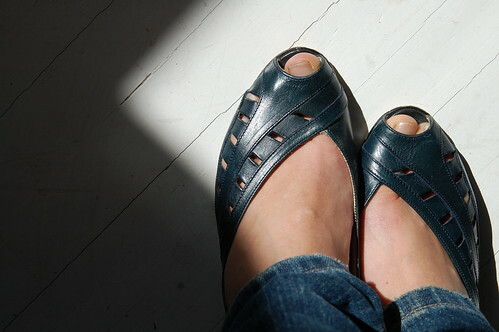 Now that it is almost time to put away my winter footwear, I’d like to find some lovely spring-y flats. In my ideal world, they are a) comfortable b) hardy (i walk to work & home each day with a dog) c) cute as heck d) go with everything. This might be impossible, but I’ve been scouting around. Last week I enlisted the help of Jane and she put together a drool-worthy selection that seriously threatens my bank account. Those Maloles are so so lovely! Thank you, Jane. It is now my mission to add a pair of Maloles to my shoe collection one day very soon. Then EZ posted about Marais USA. Colourful, sweet and affordable. As soon as this collection is released, I’m going to order a pair. Yesterday, Ellie posted this selection of grey & mustard flats. I’m pretty much about to buy #3. I’m just debating the right colour – black (practical) vs. grey (my all time fav) or both? On Thursday night, I went out to dinner with Dominic and we stopped into Franny Vintage, just a couple blocks west of the workroom on Queen. What a cute shop! They sell a mix of vintage clothing, shoes and Cheap Monday jeans. I couldn’t resist buying these Bandolino navy pumps. I have an awesome pair of navy pumps already, but these fit and have that amazing cut-out detail and I do love navy. It never fails, even when Dom & I don’t mean to shop, we end up finding awesome little treasures that we can’t help buying. Our shopping karma is perfect together. Do you have friends like this? It was always rather dangerous when he came to visit me in NYC and we would hit the shops. The weekend would end with such an enviable stockpile of goodies that I couldn’t even feel guilty about all the money I had spent. Now, that’s a good shopping partner. I just looked in my closet, I’m getting those #3 flats in black! 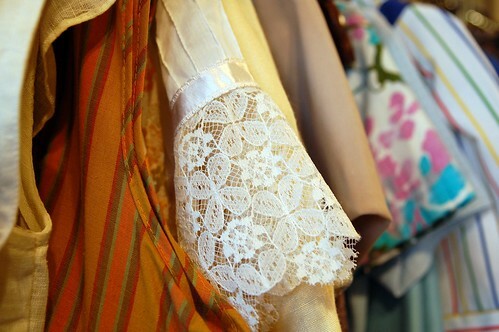 Franny Vintage’s owner, Kerry, is awesome! I’m glad you found something you liked in there. I bought a really beautiful purple vintage thai silk skirt there at Christmas time that I wore on New Year’s. I’ll have to go back in there soon, I need shoes too! I knew as soon as I saw your navy shoes that they were from Franny Vintage – They are so fabulous! As soon as it’s sunny and warm I’ll walk my lovely white pumps from Frannys to the workroom and we can be vintage shoe models together. p.s I was reading an older post about your on going love of fairies – alas I have found my kindred fairy buddy! those shoes look so pretty! I am tempted to buy some grey heels on etsy, but I have never bought shoes online before. I usually like to try on the shoes before buying them. I have had shoes on my mind too! I recently fixed all my broken shoes! It feels so great! Because it feels like getting new shoes!! me again! I tagged you! Come and play! You’re welcome! I really want those Maloles I posted too! !